Robots are not only a ton of fun but can teach kids a lot. And building a robot is the quintessential STEM activity that reaps one really awesome result. So we’ve chosen our favorite picks. For little ones who aren’t quite ready to build one of their own to older kids who are interested in engineering, design, and technology, there’s a robot for every kid on this list. Robotics falls under STEM learning. STEM stands for Science, Technology, Engineering, and Math. STEM-based activities such as using, coding and/or building a robot promote creativity, and cultivate problem-solving skills, critical thinking skills and more. And let’s not forget they are fun too! The robots on our list below will teach kids all of the above and they’ll have so much fun doing it they won’t even realize they are learning. If your child is interested in robots, coding or technology in general, we’ve got a robot for them. Most robots are suitable for kids at least 6 years and older, but we’ve made sure to include a robot for the preschool-aged engineers of the future too! 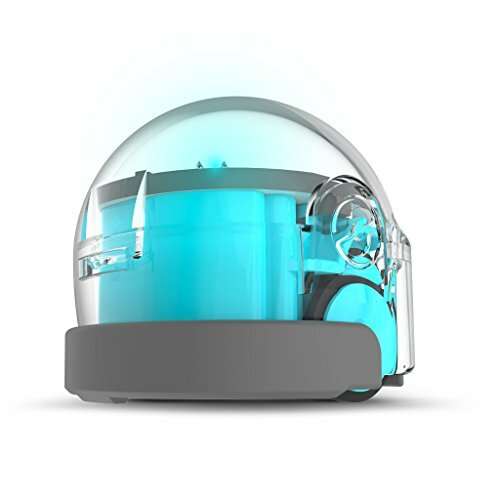 For curious kids ages 6 years and up, the Dash Robot is an amazing STEM activity that kids will love and enjoy for years to come. Dash connects to a smartphone or tablet and can be controlled by one of the 5 free apps which teach kids how to code. And best of all, kids won’t have to wait to get started playing with their new robot since Dash comes fully charged and can play up to 5 hours. Dash is a durable little robot that moves quickly over pretty much any surface and detects any obstacles in its way. The fun, easy-to-use apps make learning how to code and control Dash easy. While not included with this Dash set, fun accessories are sold separately including a bulldozer bar, a ball launcher, a sketch kit, a xylophone and more. A fun way to teach kids to code. Comes fully charged, ready to play. 5 apps are fun and easy-to-use. No accessories included. Must purchase separately. Cozmo isn’t just some robot. He’s got a lot of personality and expresses hundreds of different emotions! This smart little robot will even recognize your child’s face and remember his or her name. To explore and program Cozmo, kids will need to download the app, Code Lab. For beginners, kids will start in Sandbox mode to learn how to code. Once they have the hang of it, they can step up to Constructor mode for more complex projects. Kids will even be able to see what Cozmo sees via his built-in camera when they put it in Explore Mode. For kids 8 years and older, Cozmo will not only teach kids how to code but play games with them like Memory Match, Keep-away and more. Teaches kids coding in two different modes on a free app. Expresses hundreds of emotions on his facial display. Can recognize users and remember their name. Kids can play games with him. For the older kids who love Star Wars, why not get them their very own BB-8? This little droid by Sphero will have kids 9 years and older fighting the First Order via the free app that controls this droid. The Bluetooth enabled BB-8 has a 60-minute battery life and charges on its own induction charging stand. All from the app, you can control BB-8 as well as record and play holographic messages. When you set BB-8 to the “Patrol” mode, BB-8 will go off exploring! BB-8 responds to 10 voice commands such as “Go Forward” and “Go Explore.” It’s also waterproof and made of a durable polycarbonate shell. 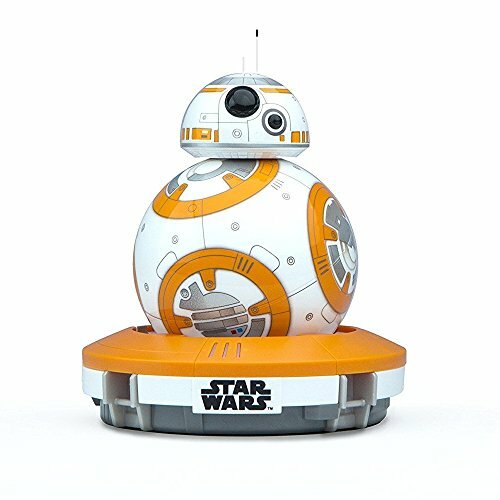 Kids will need a phone or tablet to control BB-8 and it has a little trouble moving on extra smooth surfaces such as hardwood floors. The free app allows you to record and play holographic messages. Doesn’t work well on smooth floors. Requires a smartphone or tablet to control. Kids will get moving and learn some important skills with the Tag Movi robot. With 6 games including Animal Actions, Think Moves & Shapes, Tag and more, kids will have fun and not realize they are learning too. The games on this robot teach preschoolers critical thinking skills as well as basic instruction they’ll need in kindergarten such as following directions and listening skills. Tag Movi makes over 60 different faces has 360 degrees of mobility. With only 2 light up buttons on his head and 3 on the front of his body, this robot is easy for any young child to use. 6 games will get kids up and moving and learning. Helps develop kids critical thinking skills. 60+ facial expression kids will love. Requires a good amount of floor space. Runs into walls and furniture easily. Kids will have everything they need to build one of 5 robots. Some robot choices include Vernie the Robot, Frankie the Cat and M.T.R 4. Kids then can connect their robot to the free app where they can control it and learn how to code it to perform certain tasks. 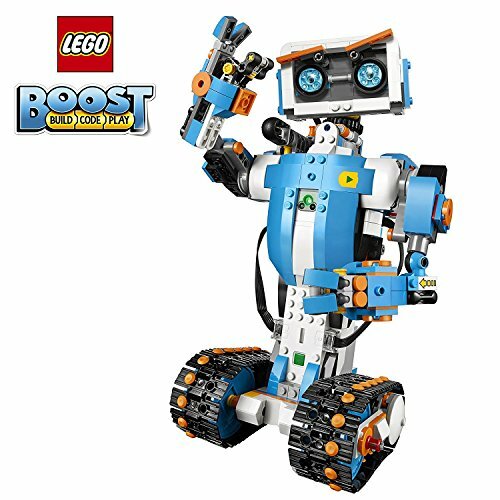 This robot set is good for kids 7 years and older. Included in this set are more than 840 Lego pieces, two encoded motors, a color & distance sensor, and a Lego Move Hub. Can build 5 different models. The free app is easy to connect to robot and use. Comes with a color & distance sensor as well as encoded motors. The app crashes if you don’t have a newer tablet or smartphone. Check the companies website to make sure your smart device is compatible. This pocket-sized robot is called Bit, and it is here to teach kids basic coding. For kids 6 and older, Bit comes already assembled and ready to code. And the best part– no screen required. To code, kids will use a marker and draw commands. Bit will then follow the code kids have drawn out. However, for more advanced coding, kids can go online and use OzoBlockly, a programming editor, to create more complex codes for Bit. Kids can also give Bit its own character by decorating Bit with the included stickers and pop-outs. So not only is this a great STEM activity but a STEAM activity! Easy to use, ready to play. No screen required to get coding. Comes with stickers and pop-outs to personalize Bit. Bit doesn’t work well on carpet or surfaces with a lot of bumps. Keep it on clean, smooth surfaces. It’s hard to deny how cute Botley is. But he’s not only just cute. He helps kids cultivate their STEM skills while having tons of fun! Botley is also a great screen-free choice for kids too since he doesn’t require a tablet or smartphone to use. 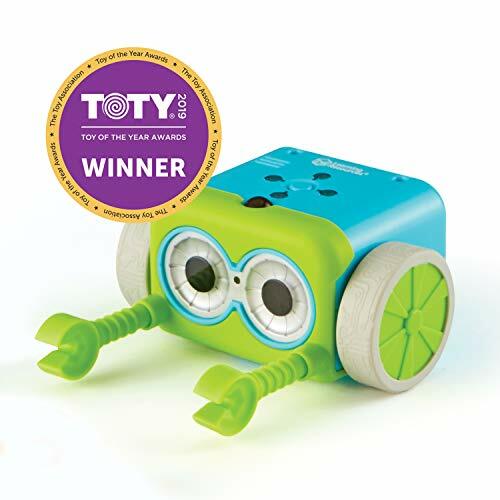 The set not only comes with Botley but 76 other pieces to teach kids to code and have Botley doing all sorts of activities including following an obstacle course designed by your child. Kids will program Botley with the included programming remote. Botley has removable arms so kids can have him push and move objects around. 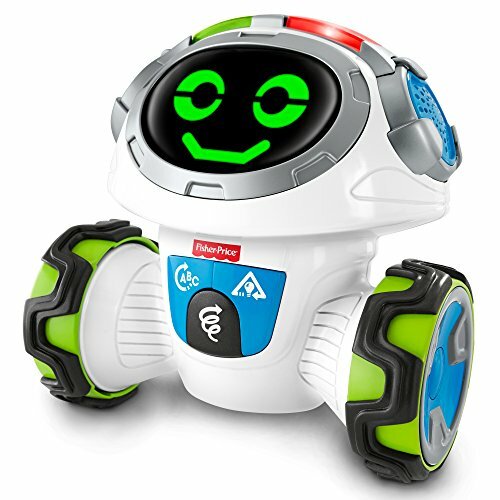 This robot is great for kids as young as 5, but be warned, it doesn’t include batteries, so make sure to have 5 AAA batteries available so kids can start playing with Botley right away! Easy to use for kids 5 and up. No screen required. Includes programming remote. Includes everything kids need to make obstacle courses and more. The Meccano Meccanoid robot is for the older kids and is quite nearly as tall as they are! 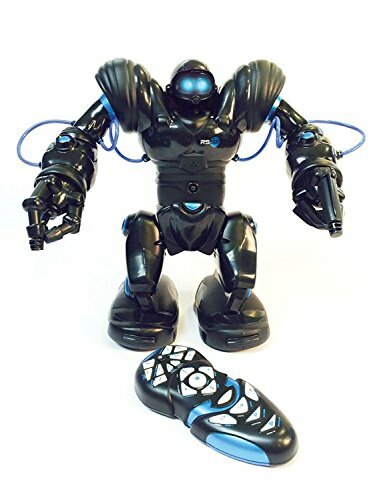 For kids ages 10 and older, Meccanoid stands 4 feet tall and has over 1,000 pieces and 10 motors that kids will construct on their own. But does it work? You bet! Meccanoid can recognize more 100 voice commands and can remember names and birthdates. And if kids want, they can rebuild Meccanoid into a dog, dinosaur and more. 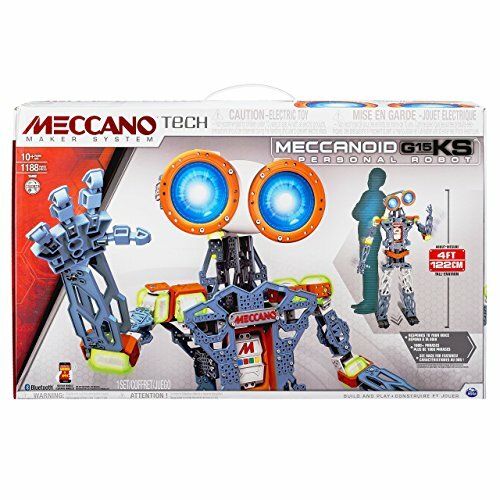 Kids can program Meccanoid to do various motions and then have them play them back. And for extra fun, kids can hook it up to their tablet or smartphone and via the Meccanoid app, can make it move that way as well. The full-size robot stands 4 feet tall. Kids can make it into a robot, dinosaur, dog or more. Recognizes over 100 voice commands. Can program movement via app’s Rag doll avatar. Comes with tools to build a robot. 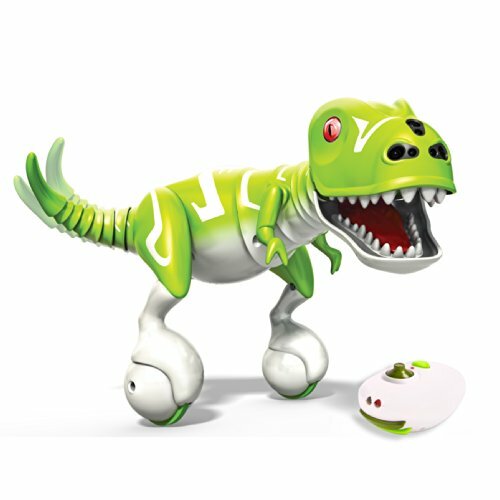 Zoomer Dino comes with a remote control, but that’s not the only way kids can play with Zoomer Dino. They can control him with their hands too! This little dinosaur has got a bite! His eyes indicate his mood and if you want to make him mad just give his tail a yank and watch him get angry! Zoomer Dino reacts to any type of touch or stroke and will let you know he’s happy. Zoomer Dino zooms around on two wheels, and goes forward, backward and even spins 360 degrees. Kids can let him roam or teach him to do tricks. For complete control of Zoomer, simply use the included remote. This robot is good for kids 5 and up. Kids can move him by hands or remote. Color changing eyes indicate mood. Can train it to do tricks or roam freely. Easy to use. For kids as young as 5. The Robosapien was designed by a NASA scientist, so you know the technology has got to be good. He speaks “international caveman” and responds to touch and sound. Kids can control him via a remote control or by downloading the free app on their phone or tablet. His arms have two types of grippers for grabbing and picking up objects. He is surprisingly fast and can walk or run. He has 67 preprogrammed functions including dance, kung-fu, throw, and yes, even rap and much more. This robot is for ages 6 and older. While it can be work via a remote or app, we found that the app was easier to use in order to control Robosapien. Can be controlled via remote or app. 67 preprogrammed functions that are very entertaining. The remote control is a little difficult to use. Q: What age can my child start using a robot? A: Kids as young as 3 years old are ready for a robot! However, building and/or coding a robot will need to wait until about 6-9 years old, depending on the robot. Q: Does my child need a tablet or smartphone to use a robot? A: Many of the robots on this list do need a smart device to code the robot but not all. We’ve noted which ones don’t need a screen and which ones do. The robots that do require a screen help teach kids how to code. We absolutely love the Wonder Workshop Dash Robot! 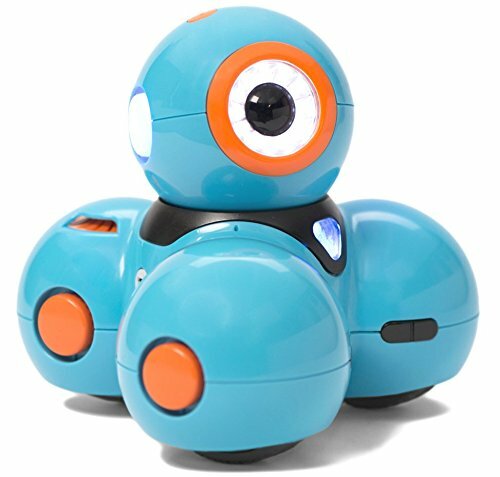 It has a long battery life, is a fun way to teach kids how to code, and can do so many activities. 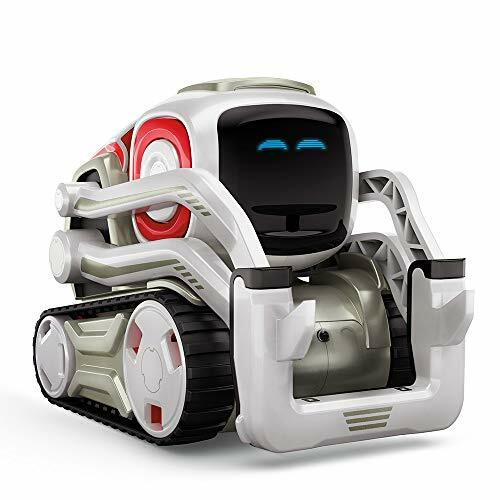 Even though additional accessories like the bulldozer or sketch kit are not included, they are available for purchase and will ensure kids will never get bored of this robot.